Probably due to the uncontrolled comment section of this blog and most likely due to the comment section of the particular posts (here and here, comments hidden) which is full of totally irrelevant comments, I've started to receive strange emails on strange topics from people I don't know and who should not have my personal email address. The two events may not be related, though I suspect they are, judging by the content of the emails. I am shutting down the comment section temporarily (comments are restricted to members of this blog, which means me and myself). I am reporting these suspicious emails to the email provider, and doing whatever necessary (though I don't know what) to protect my privacy. I am not for restricting the freedom of speech, but my right to privacy comes first, and this is my personal blog. I hope the shut down will be temporary. (OT) Friday Humor: Sing Along! "The NSA Is Coming to Town..."
You better watch out, you better not Skype, you better Log Out, you better not type, The NSA is coming to town. Images of what it feels like to not have money to spend to do anything substantial. There was a discussion on Twitter last night between two level-headed people I follow on the cost of decommissioning Fukushima I Nuclear Power Plant, decontaminating areas in Fukushima Prefecture, and paying compensations to the people who have been displaced by the nuclear accident - namely the residents in the former evacuation zones around the plant. While the Japanese national government puts the cost of decommissioning of the plant, decontamination and compensations at only a few trillion yen (tens of billions of US dollar), the two's tentative conclusion was that it would be at least 20 trillion yen, probably more because the government didn't spend enough on the get-go in 2011, and therefore it would cost more in the future. In other words, penny wise pound foolish. Despite the promise by the LDP administration under Shinzo Abe that the government will be at the "forefront" in dealing with the accident, no money has gone to help TEPCO and workers trying to maintain the plant and contain the contaminated water. 21.5 billion yen has been pledged by the government to come up with a solution to the contaminated water, but it is just a pledge at this point. So, when I saw this tweet and photographs from TEPCO, I was puzzled at first (I couldn't figure out what the workers were doing), and saddened when I realized what they were doing. "Countermeasures for rainwater at Fukushima I NPP: The drainage channel that goes through the plant compound to the ocean. In order to prevent contaminated water from flowing into this drainage channel, we are waterproofing the channel and covering it. You can see the details here (link to Facebook page)." The workers are manually cleaning out the open drainage channel that goes directly into the ocean where rainwater and contaminated water (high in beta-nuclides) have flown since the accident. This measure is to turn the drainage channel into a culvert. The drainage channel leads to the ocean. To prevent the contaminated water flowing into this channel, we are waterproofing the surface of the channel and putting the cover over the channel. The lower-right photo shows the workers scooping the remaining water in the channel with buckets. Normally, we use a pump, but as the water level goes low, the pump does not work. So, in the end, it is the patient manual work by each worker that does the job. The drainage channel is 1,300 meters long in total. We will gradually work upstream, and aim at turning the channel into a culvert within this year. When the earthquake, tsunami, and the Fukushima nuclear accident hit Japan in March 2011, I remember having read several financial analysts outside Japan who said, "This may be Japan's end game, as it has no other choice but to print money in enormous quantities to pay for the disaster recovery and reconstruction." I thought so too. I thought, "The government should properly panic and commandeer all available resources and spend literally tons of Bank of Japan notes to contain the disaster." It was a make-or-break moment. Well the DPJ government panicked the wrong way and put their collective head in the sand, like the mascot of Fukushima I Nuclear Power Plant (ostrich); it resorted to the cheapest option of "talking" - everything is fine, there is no (short-term) health effect, only the baseless rumor of radiation harming the farmers in Fukushima, it's TEPCO's problem, etc., etc.. Sometime in middle of 2011, I think, I saw Mr. Taro Yamamoto, now an Upper House Councilman, in one of those mind-numbing Japanese TV talk-shows. The other guests were all saying that Japan has to spend money on economic growth, as if there had been no earthquake/tsunami/nuclear accident. Yamamoto said, "We should spend whatever it takes to end the nuclear accident, decontaminate, test foods, whatever it takes. Even we go broke as a nation as the result, as long as people are here and are healthy, we will be able to recover some day." Yamamoto was roundly ridiculed by the guests and the viewers. I totally agreed with him. Now it's rather late. All the money that Abe is making Kuroda to print goes to financial institutions and accumulates at the central bank as "excess reserve" for the financial institutions to bet on risky assets. Just like it's been happening in the US ever since Blackhawk Ben and Hank (Paulson) threatened the Congress with one sheet of paper and got $700 billion (70 trillion yen) in the fall of 2008 to save banks. (UPDATE) Mr. Thamsanqa Jantjie says he was hallucinating, seeing angels, according to AP. He insists his sign language is proper, which is vehemently contested by sign language experts and people who use sign language. They say it was gibberish. Meanwhile, New York Post (only one of so many) is rather upset with the president of the United States taking a selfie with a leggy blonde who happens to be the prime minister of Denmark. You can't make things like this up, but this unnamed man apparently did. 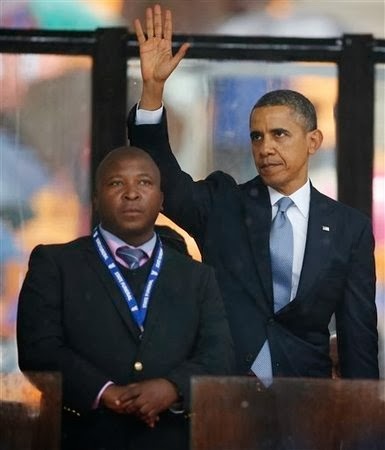 JOHANNESBURG (AP) - A man who provided sign language interpretation on stage for Nelson Mandela's memorial service, attended by scores of heads of state, was a "fake," the national director of the Deaf Federation of South Africa said on Tuesday. Asked about the claim by The Associated Press, South Africa's government said it was preparing a statement. Three sign language experts said the man was not signing in South African or American sign languages. South African sign language covers all of the country's 11 official languages, according to the federation. It wasn't immediately clear if the unidentified man was using a different method to communicate. "It was horrible, an absolute circus, really really bad," she said. "Only he can understand those gestures." South African parliament member Wilma Newhoudt, a member of the ruling party who is deaf, also said the man communicated nothing with his hand and arm movements. AP interviewed both Druchen, who also is deaf, and Newhoudt by telephone using an interpreter. The man's identity hasn't been disclosed. What's more pressing at Fukushima I Nuclear Power Plant is not measuring radiation levels around the SGTS pipe where 25 sieverts/hour radiation source may be inside (to be sure, again, this 25 sieverts/hour was NOT measured but derived by calculation), nor removing the fuel assemblies from the Spent Fuel Pool on the top floor of Reactor 4 (again, not individual "fuel rods" that are inside a fuel assembly), which has the lowest radiation levels of all reactors (except for Reactors 5 and 6, which are in cold shutdown in the true sense of the word). It is, as late-Masao Yoshida, Fukushima I NPP Plant Manager at the time of the accident, said, what to do with the contaminated water that keeps increasing. Of particular concern (supposedly) of the national government and TEPCO is whether the contaminated groundwater (albeit low contamination of gamma nuclides) is leaking into the plant harbor. In the embankment between the plant harbor and the turbine buildings for Reactors 1 through 4, workers have been injecting waterglass into the artificial soil there to create impermeable walls in the soil to stop the flow of groundwater into the harbor. Never mind that their very work causes the groundwater to rise and go over the top of the underground impermeable wall, or go somewhere else and find its way to the ocean anyway. 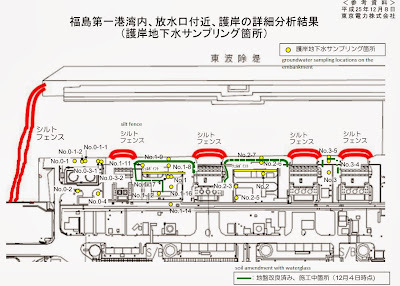 TEPCO has been frequently monitoring radioactive materials (gamma nuclides such as cesium, all-beta including strontium, and tritium) in the water samples taken from these numerous observation holes in the embankment. However, samples from the seawater in the harbor are taken far less frequently. Nuclear Regulation Authority has been calling for continuous monitoring of seawater for some time, and the topic came up in the third meeting of NRA's ocean monitoring group on December 9, 2013. But the word that came out of NRA Commissioner Kayoko Nakamura was, "Continuous monitoring system is an expensive purchase..."
TEPCO is considering three locations near the south discharge and the north discharge to install continuous monitoring system to detect the leak of contaminated water, and explains it is taking time to install because of the rough ocean. People questioning, why not install inside the open channel (inside the harbor near the embankment)? The question is nothing new. 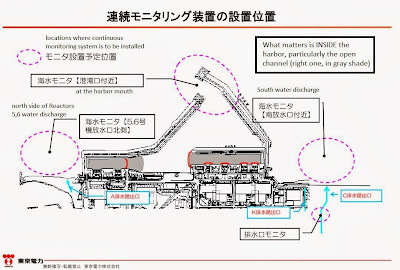 When I asked TEPCO in January this year when they started digging the observation holes along the embankment and analyzed the groundwater samples, TEPCO answered that they were measuring in several locations inside the harbor, and they were measuring in the ocean, too. They could detect the change that way, no problem. That was the answer then, and that is the answer now. What's at issue now is whether the highly radioactive water from the trench [where extremely radioactive water from March/April 2011 from the reactors sits] or from the reactor buildings is leaking from the embankment or not. The purpose of continuous monitoring is to know immediately if highly radioactive water is leaking. To monitor the change, it's better to monitor closer [to the embankment where the leak may be occurring]. But TEPCO insists on monitoring outside the harbor. I don't understand the reason. NRA's Kayoko Nakamura says, "Continuous monitoring is an expensive purchase." So it takes time to select [the equipment], she says. Well, what does that mean? It's not the matter of how expensive or how cheap; the opinion of the members is to do it "soon". It is not the thing to be done leisurely over six months or a year. Ms. Nakamura also says accuracy [of measurement] is important. It is important, as the accuracy has been questioned before. But no information has been disclosed as to which manufacturer and/or experts TEPCO is consulting with and on what. We still don't know the reason why the installation hasn't been done. Morita [from the Fisheries Agency]: As I said before, I don't understand why you want to install [the continuous monitoring system] outside the harbor. The discharge for Reactors 5/6 pumps out the water from inside the harbor, so there is no point in installing it outside. Morita: The water is leaking into the open channel, or so it is said. Doesn't it make more sense to install the instrument there? Can you collect daily data outside the harbor? TEPCO: Detection limit is 0.1Bq/L. The problem is whether to exclude all-beta, but we are aiming at 20Bq/L. Aoyama: gamma rays, you mean cesium-137? 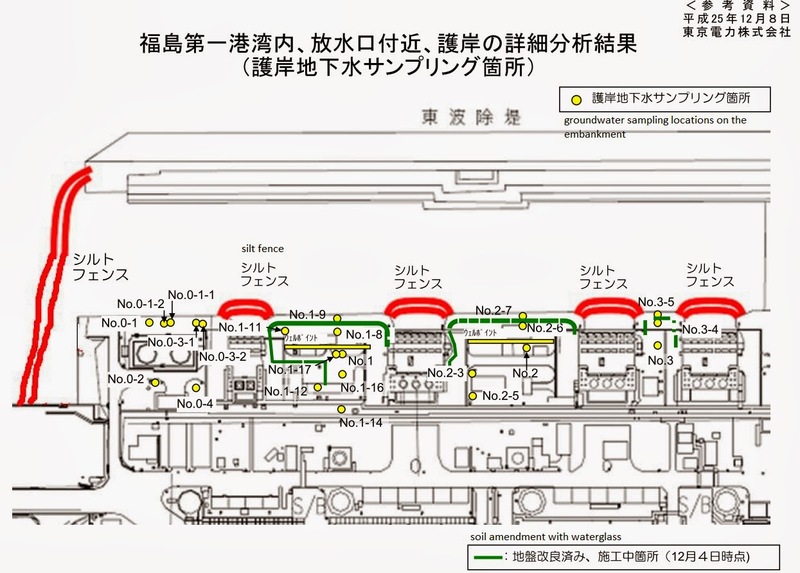 TEPCO: Cesium-134 and -137 will be monitored. 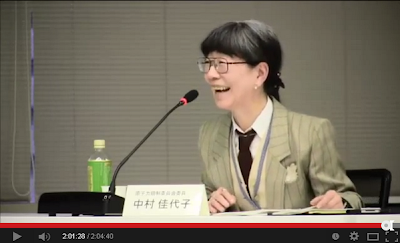 Aoyama: I don't understand TEPCO's explanation. If anyone understands, please explain. 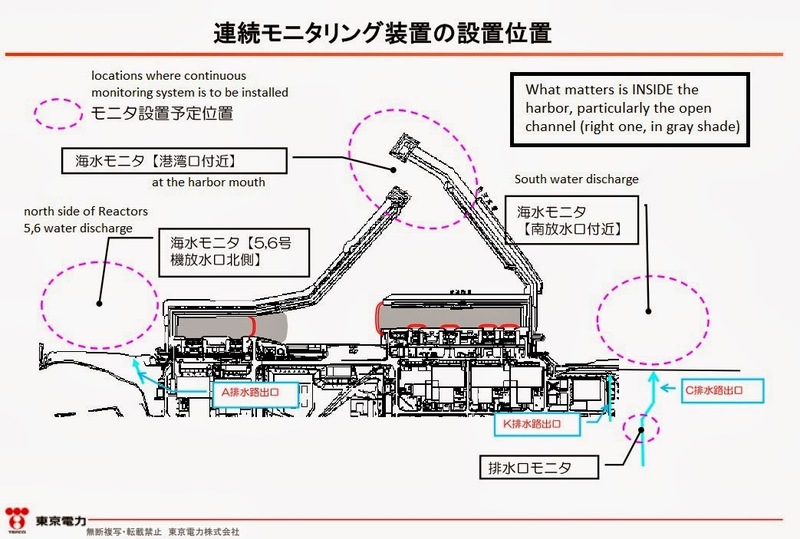 Horiguchi [National Science Laboratories Environmental Risk Research Center]: Like Mr. Morita, I don't understand either why the monitoring instruments are not going to be installed inside the harbor. Monitoring should be done at the locations where the leak is suspected. We're getting our priorities wrong. The most important thing is not being done. Well the priority seems to be the cost. After the Fukushima I Nuke Plant accident, they still think of cost as outlay of money to purchase goods and services. They don't consider the social cost of not starting monitoring the water inside the harbor as soon as possible, particularly inside the open channel right outside the embankment. As it stands, TEPCO plans to start continuous monitoring OUTSIDE the harbor hopefully next spring, maybe fall. For TEPCO and the national government, time is indeed money - i.e. money saving.